When you hear “workplace injury” one might think of falling down a set of stairs, or burning oneself after spilling a hot cup of coffee. If you actually work in an office, you would know that those are not the true workplace injuries that office workers suffer from. The real injuries of the office workplace stem from prolonged sitting sustained postures at a desk, and repetitive movements such as typing at a computer. Long hours at a desk are inevitable and unavoidable for people working in an office. So, what can you do to prevent things from getting worse or to make your injuries disappear completely? Here are 3 Exercises for 3 of the Most Common Office-Worker Injuries, that you can do at work! Trapezius aka “Traps” is a large muscle located on the back that is compartmentalized into 3 different fibers as they can perform different actions. The Trapezius is divided into Upper, Middle and Lower fibers. The upper fiber traps (UFT) located closest to the neck are often extremely tight in people with desk jobs. UFT tightness can also lead to the development of trigger points in the muscle, which can refer pain to other locations such as the head. Shoulder retractors are muscles that retract or pull the shoulder blades together. 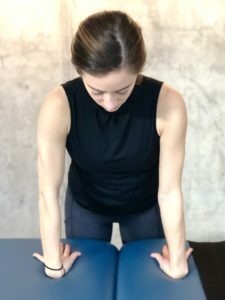 When you are told to “sit up straight and bring your shoulders back”, what you are doing is activating you shoulder retractors. The muscles that produce shoulder retraction are the rhomboids and middle fiber traps. Weak shoulder retractors can lead to poor posture, kyphosis, mid/upper back pain, and shoulder mal-alignment.